Jeffery R. Brunson, DDS is a native Texan and has been a practicing dentist in South Austin since 2001. He graduated in May 1995 with honors in Biology from Angelo State University in San Angelo, Texas. Dr. Brunson also attended The University of Texas-Dental Branch at Houston where he graduated in June 2000. While at the UT-Dental Branch, he was twice elected as Student Body President and served from 1998-1999 and 1999-2000. During that period he was also a Texas Dental Association Representitive. Following graduation, Dr. Brunson relocated to Chicago, Illinois where he received additional training at Northwestern University Medical Center and performed private practice dentistry. Today, Dr. Brunson continues to actively pursue further knowledge and education in all items related to dentistry. Along with attending a variety of local study-clubs he travels extensively to advance his education. With an active hand in dental volunteerism, Dr. Brunson consistently provides service to the local community and has donated time and services to St. David’s Theo Project, Texas Missions of Mercy, and Donated Dental Services of Texas. He has also been involved in international trips to provide treatment to the Kuna Yala of Panama and the underserved in Peidras Negras, Mexico. Dr. Brunson has received many awards for excellence in the field of dentistry, including the prestigious Capitol Area Dental Society Young Dentist of the Year (2003-2004), multiple CADS Service Awards, the ASDA (National) Student Leadership Award (2000), and the Senior Student of the Year-UTDB Alumni Association (2000). Dr. Brunson remains heavily involved in many organizations including the American Dental Association (ADA), the Texas Dental Association (TDA), Capitol Area Dental Society (CADS) and various local study clubs. He has also been a financial supporter of the Capitol Area Dental Foundation (CADF). He was also elected by his peers to serve as President (2011-2012) and Executive Board member (2008-2012)of the Capitol Area Dental Society. He has also served as a delegate for the Austin area in the TDA House of Delegates. In the Fall of 2014, Dr. Brunson was inducted as a Fellow in the International College of Dentists (ICD). Fellowship in the College is by invitation only and is granted in recognition of an individual dentist’s "outstanding professional achievement, meritorious service and dedication to the continued progress of dentistry for the benefit of humankind." Approximately 5% of US dentists receive ICD recognition during their career. Jeffery and his wife Shana met in Houston while both attending dental school. They married in Austin and have two children, Owen and Audrey. 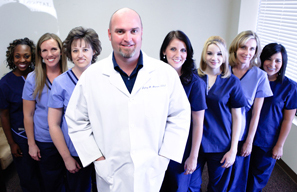 Dr. Brunson enjoys many sporting activities and is athletic as well, having played as a Varsity Letterman in NCAA Division II Football while at Angelo State University. He enjoys outdoor activities including golfing, water sports, gardening and restoring vintage vehicles.